With their bellies still full of Thanksgiving turkey, a merry group of Market Street Railways volunteers gathered at Muni’s Geneva Yard this weekend to decorate two vintage streetcars for the holidays. Per usual, the two cars — New Orleans No. 952 and Milan No. 1818 — were adorned with a colorful assortment of garlands, bells, tinsel, ribbons, and sparkly snowflakes. Truth be told, it could have been a much less pleasant experience. Year in and year out, Mother Nature has smiled upon MSR’s annual holiday decorating event by delivering warm, dry weather while the streetcars received their seasonal makeover. This year, however, it was cold and rainy. Fortunately, the new Geneva shed was completed just a month ago, which meant that the MSR crew was able to get the job done under the building’s big roof without having to endure the elements. 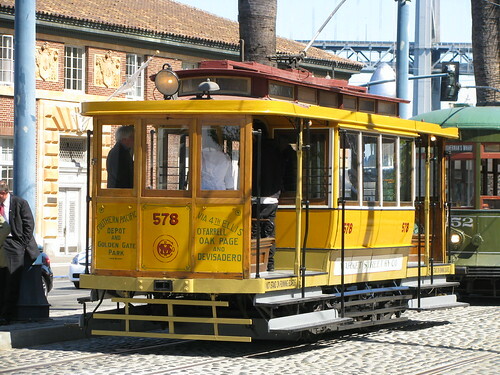 The new shed is a good thing for the preservation of San Francisco’s vintage streetcar fleet, but today it also turned out to be a very good thing for the preservation of our volunteers as well. Just in time for, well, next year, Market Street Railway is proud to unveil the 2011 edition of our Museums In Motion calendar. It literally takes a village — or, a city — to make our calendar. All the full-color images were generously donated to Market Street Railway by talented Bay Area photographers, via our thriving Flickr group. Their photos are magnificent, and we’re incredibly grateful for their contributions. Want one? The Museums In Motion Calendar is a fantastic gift for adults or kids, and they’re available for sale either at MSR’s San Francisco Railway Museum or the MSR website. Actually, that’s completely untrue. Twain never said that. In fact, the thought never even crossed his mind. Then again, he didn’t say that bit about “The coldest winter I ever spent was a summer in San Francisco,” either. 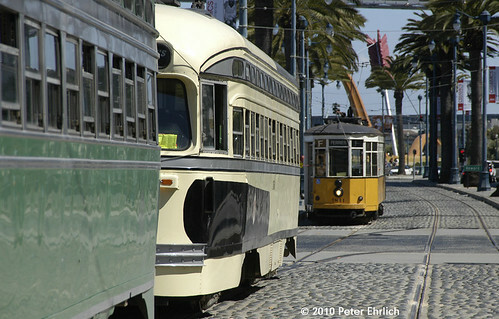 Nevertheless, both misattributions describe a set of circumstances are quite genuine: Autumn in San Francisco really does function as the city’s summer, as the cold fog of summer melts away amid gallons of warm fall sunshine. 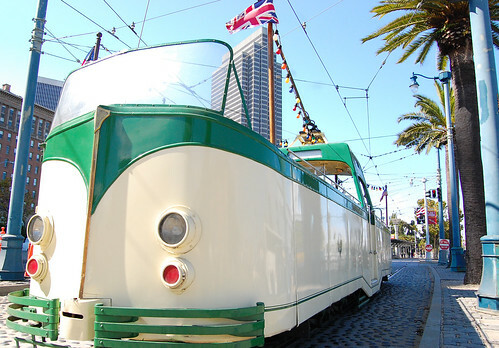 As part of an effort to bring a streetcar line to Downtown Los Angeles, two LA filmmakers produced this tidy little video. 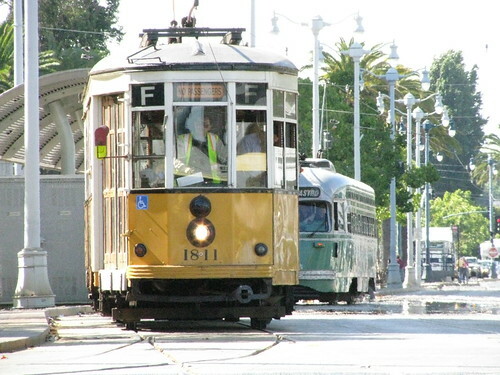 It extols the economic and social benefits of streetcar service, and provides nifty computer-generated visualizations of what modern streetcars might look like operating in downtown LA.